With our newest series of blog posts, we’re delighted to introduce you to a new CFTC staff member: Amboka Wameyo, CFTC’s Regional Program Manager – Africa. 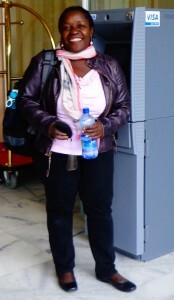 Amboka brings to CFTC over 14 years of international development experience at both head office and country levels, working across sectors in advocacy and long-term development programming. She’s had experience in Canada for large international development agencies and much field experience, having worked with Action Aid in Kenya as a Policy Research Coordinator and at their headquarters in London, UK as the Africa Policy Officer, and later joining World Vision in Tanzania as the Africa Regional Advocacy Advisor moving to their Canadian HQ in 2008 as Advocacy Program Integration Manager. Amboka joins us at an exciting time as we roll-out our Roadmap to Change in Ethiopia. We gave her about a week-and-a-half to get oriented here in Toronto, showed her how the coffee maker works and where the supply cupboard is, and then we sent her off to Ethiopia to meet CFTC staff, our partners – oh, and while she’s there – facilitate a Roadmap to Change session. Olympic 2012 10,000m relay gold medal winner Tirunesh Dibaba of Ethiopia with teammates Werknesh Kidane (L) and Beleynesh Oljira (R). Photo credit: REUTERS Phil Noble. Addis Ababa, August 27, 2012-This is Ethiopia, the country that produced some exceptional gold medals at the recently-concluded London 2012 Olympics. The in-flight magazine on the Ethiopia Airlines Boeing 777 that brought me here contained a feature story profiling some of this country’s great runners. It offered some suggestions as to why the country produces excellent long distance runners: children in primary school can run up to ten kilometres to get to school and in the evening they run back home in time for daily chores. They start aerobic exercises at a tender young age! I am in Addis Ababa today, in the capital city where schools are found at closer proximity and children don’t run as much. 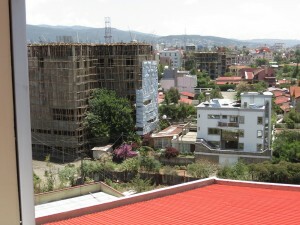 Something else is happening in Addis Ababa, though: there is construction everywhere. Tall, incomplete buildings are visible as far as the eye can see. Debra had mentioned this to me, but I had no idea how extensive the construction was! Addis Ababa is a city alive. In addition to the construction boom, many of its roads are being expanded and redone. CFTC’s Country Representative in Ethiopia, Gebriel Galatis, tells me all this redevelopment of infrastructure is in preparation for next year’s festivities to celebrate 40 years since the formation of the African Union, which sits in Addis Ababa. 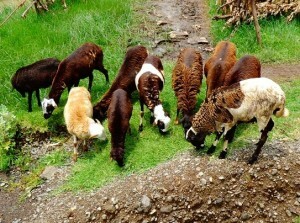 Ethiopian sheep, outside of Addis Ababa. Ethiopia has the largest livestock population in Africa. As I sit in my hotel room looking out at the ongoing construction, I wonder if it will have any direct impact on the lives of children in Ethiopia. Then I see something interesting: in between the buildings, a luscious green patch of grass thrives. And a young man (or boy, I can’t see quite clearly) has discovered this precious green patch and is standing guard as his sheep graze. I count eight sheep…and a pigeon. Yes, Addis is alive, I conclude.